Even though there are plenty of e-book readers and digital tutorials available for to learn how to make the most from software applications. For those of you that still enjoy reading hardback books and would like to learn more about the awesome Affinity Designer software. You’ll be pleased to know that a new WorkBook has-been released that is crammed with useful tips, illustrations and a complete design process of nine projects. The Affinity Designer WorkBook is now available at a special introductory price offering a 20% discount and priced at £30 for a limited time. Serif the creators for the Affinity software explain a little more about what you can expected in the new hardback book and its downloadable resource files. You’ll be taken through the complete design process of nine incredible projects, created by some of the best designers and illustrators in the business. Not only will you learn every step of how they have created their work in Affinity Designer, you’ll see how they approach their work from coming up with concept ideas, considering lighting and composition to dealing with clients. Lavishly illustrated instructions, guides and expert tips help you make the most of Affinity Designer’s stunning capabilities. Follow our step-by-step guides to make amazing projects created especially for the Workbook by leading illustrators and designers, and get an insider’s view of their workflow. 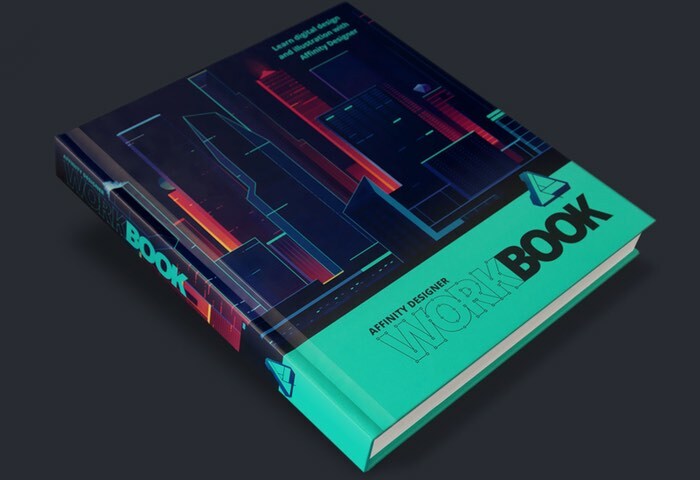 Affinity Designer Workbook is bound in a stand-out hard cover with 448 full colour pages. Available now with an introductory discount, it’s the essential companion for anyone using Affinity Designer on macOS or Windows.